Growing up in the American Midwest, my only exposure to wisteria was a mention in the pages of a Nancy Drew mystery. It sounded like an intriguing, if not beguiling, flower. 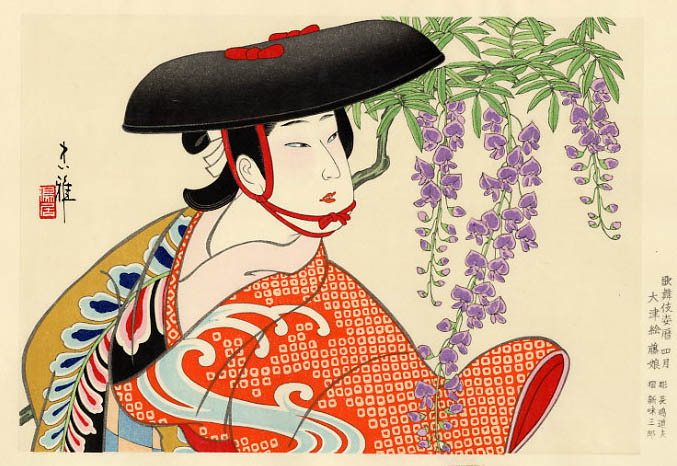 Fast forward to my life in Japan, where wisteria is native, and this dangling bundle of aromatic blooms is now a feature of my life, too. Wisteria comes in a number of varieties, with colors ranging from deep purple to white and every shade in between. Different varieties bloom at different times in the late spring blossoming window of mid-April to mid-May. 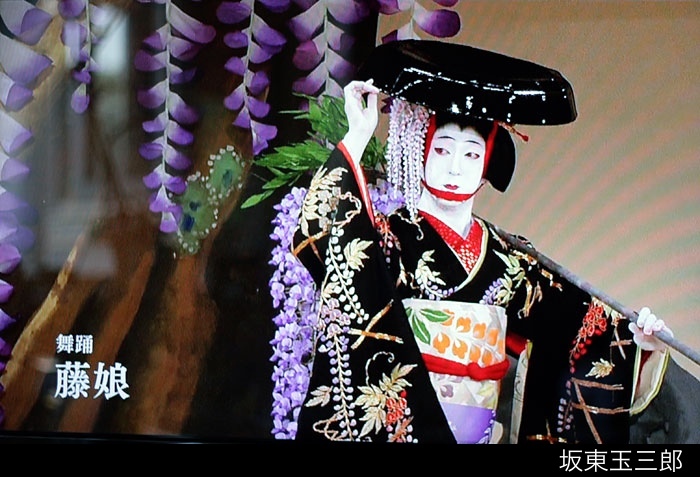 Even so, having first arrived in Japan in autumn, my introduction to wisteria was not the actual flower, but the well known Kabuki character, Wisteria Maiden (fuji musume). 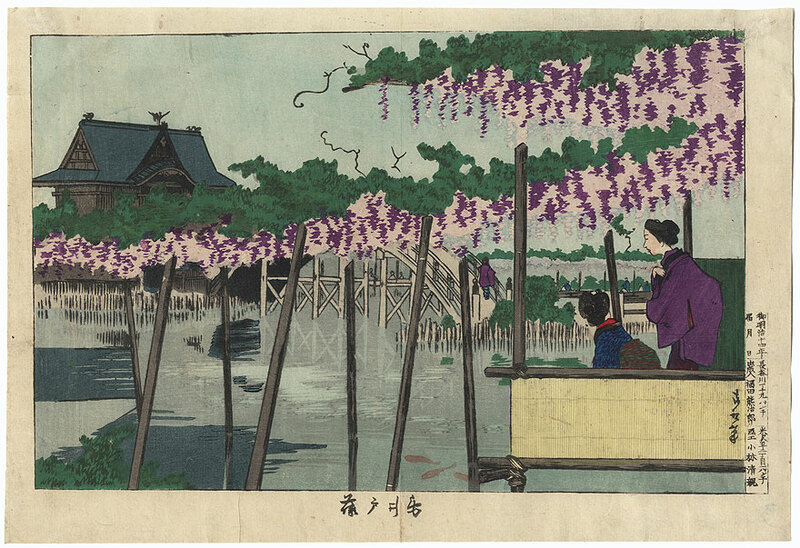 Still, when one is out and about in Japan, it is easy to find wisteria–sometimes in bloom and more often not. Trellises supporting wisteria vines can be seen in many playgrounds, parks and temple grounds. In public parks they are often metal structures on four legs, with the vines forming a canopy overhead. Frequently there is a picnic table or two beneath where summertime visitors can relax in the shade. These trellises are usually only a few meters square, but the abundant spring flowers with their soft, sweet scent, still create a wonderful atmosphere. 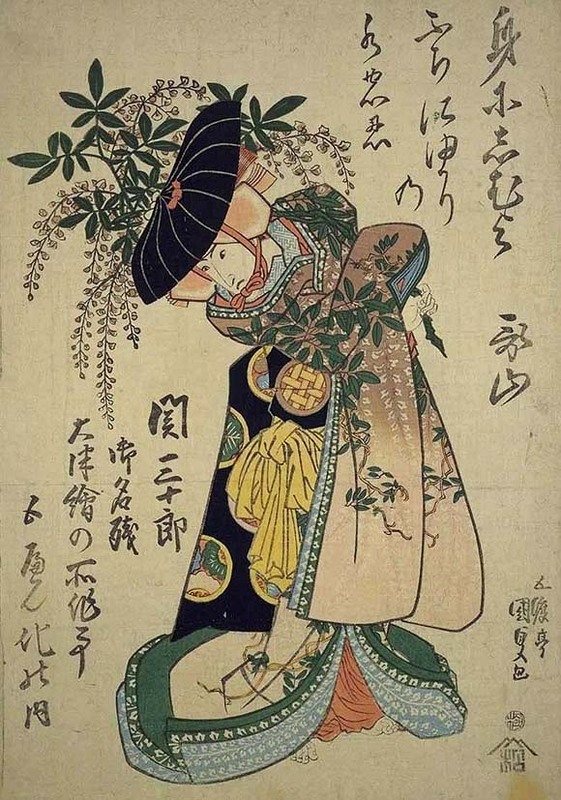 Multiply this in a garden dedicated to wisteria and you have a spectacular effect that, conveniently, occurs during Golden Week, when many of us have more time to enjoy it. 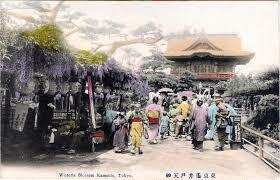 The largest wisteria garden in Tokyo is at Kameido Tenjin shrine, a shrine founded in the 17th century and dedicated to the god of learning. The substantial shrine grounds are situated in accordance with fung shui principles–water in front, mountains behind. In this case, the shrine is fronted by a large pond crossed by three bridges representing the past, present and future that form the approach to the shrine itself. 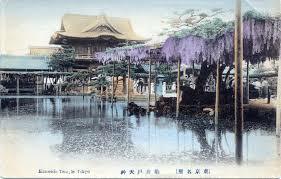 The pond is surrounded by wisteria vines on trellises extending over the pond. 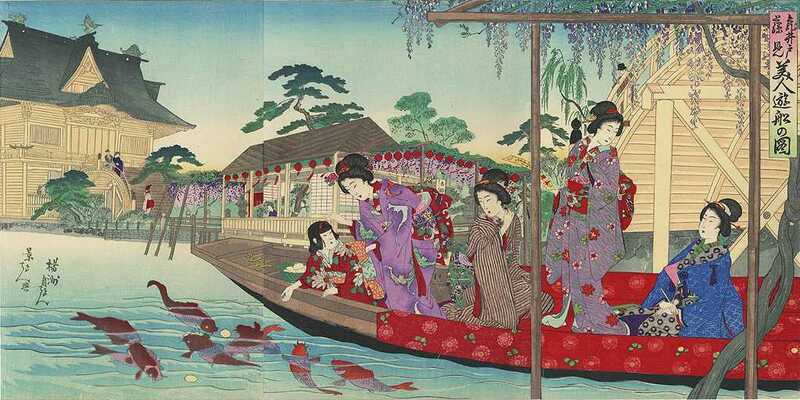 … as well as in some of Japan’s earliest (ie, 19th century) picture postcards. Perhaps even more famous than Kameido Tenjin is the Ashikaga Flower Park in Tochigi, about an hour and half north of Tokyo. With over 350 wisteria vines, including several that are 140-150 years old and cover trellises stretched over 1,000 square meters each, this park is a wisteria-lovers dream. In fact, one of the park’s claims to fame is that in 2014 CCN identified this as one of its “Dream Destinations”. 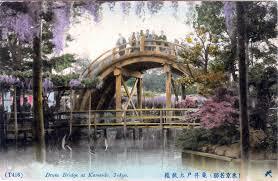 The park even features a gracefully arched bridge covered with a pink wisteria. Without question, cultivated wisteria gardens are beautiful. But perhaps one of our favorite encounters with wisteria occurred a couple of years ago when we were driving on the Noto Peninsula. We came around a corner to be greeted by wisteria that was overtaking its neighboring trees, with dramatic effect. 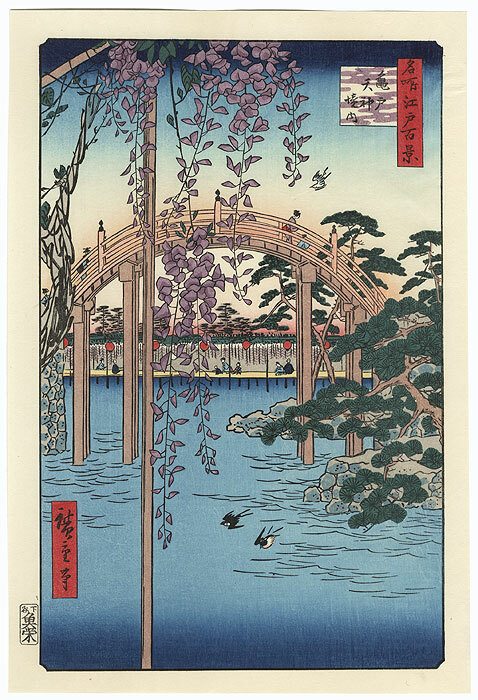 We were reminded that wisteria, being native to these islands, can be found–and enjoyed–just about anywhere. So long as you time it right!